Study shows stomach stapling makes people younger? Fat Chance! When metabolic syndrome is reversed, inflammation, free radicals, and dysfunctional biochemical pathways lessen and that creates a milieu for healthier lifestyle choices like exercise, sleep, and general happiness. 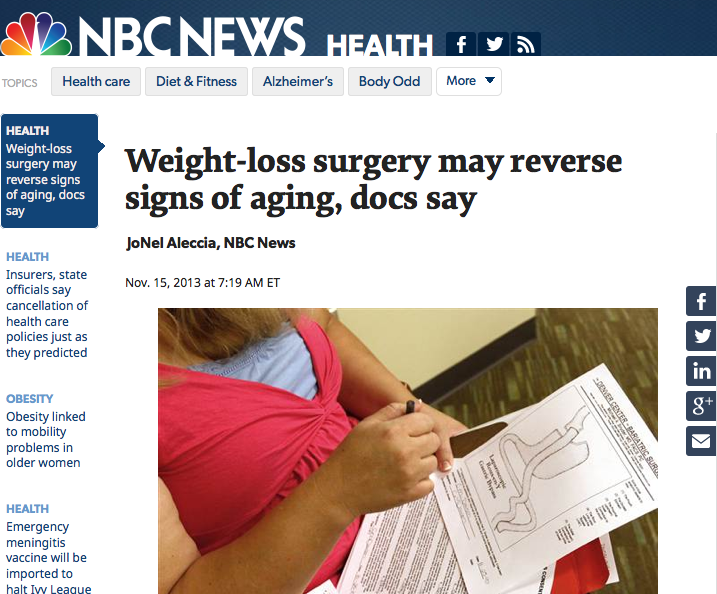 Weight loss surgery makes you younger- but how? When the entire environment improves by reducing the number of old and dysfunctional fat cells, the remaining cells are in a happier environment with less insulin, hyperglycemia, oxidation and glycation (which is a toxic environment for all cells to be bathing in).